Late in the fall of 1863, Union forces under the command of General Nathaniel Banks occupied the lower Rio Grande valley, but the Federals had no intention of using Brownsville as a marshaling point to launch an invasion into the interior of Texas. Rather the purpose of the occupation was to seal off the border between Texas and the French-dominated Empire of Mexico and disrupt the flow of Confederate cotton to Europe. Hundreds of European ships stood ready off the mouth of the Rio Grande to transport the valuable cotton, and neutral brokers in Matamoros held the badly needed medical supplies, British Enfield rifles, and gold necessary to keep the Confederacy afloat. Now the trade route had to be moved far to the northwest through Eagle Pass, adding an arduous three hundred miles to the journey. The new trail lay through miles of desolate and dangerous country swarming with Mexican bandits and hostile Indians, more than doubling the cost and time of delivery. The intolerable situation eventually set off a chain of events that was to once again bring the legendary John Salmon Ford to the forefront of Texas affairs. At nearly fifty, Rip Ford had lived a picturesque career�doctor, lawyer, journalist, two-term state senator, captain of the Texas Rangers and a veteran of the Mexican American War. He arrived in Texas from Tennessee in 1836 after a failed marriage, and over the next five decades was to become one of the fantastic but nearly forgotten figures of the old frontier. Restless, impatient, brilliant, sometimes erratic, yet above all compulsively self-disciplined when it served his purpose, Ford was a man who instinctively ended up in the middle of the action. Profane in the extreme and a born gambler, he was free with both �his money and his pistol,� a leader of renown and a diplomat of considerable merit. Nicknamed �Rip� for rest in peace by those who admired him and served with him during the war, John Salmon Ford was truly the last of his line. He lived during legendary times and died poor as did most of the great frontier captains. 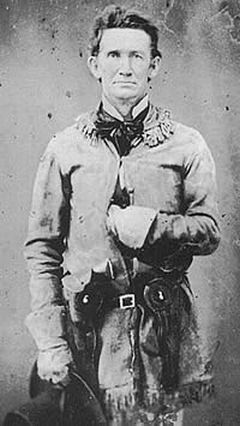 In 1861, the Secession convention appointed Ford a colonel of state cavalry and sent him south to the Rio Grande where he did good service until the end of the year. With the border pacified, Ford was furloughed and his command was dispersed to Colonel Earl Van Dorn�s troops. In April 1862, General Paul O. Hebert, the Confederate military commander of Texas, offered him a commission as a major, which for reasons of his own, Ford refused. Finally, he was appointed as Superintendent of the Bureau of Conscription with responsibility for running down draft dodgers, a task which he abhorred. Ford despised the draft laws, believing that the good men had already volunteered, and he felt that the exceptions made for petty office holders, slave owners and men wealthy enough to buy their way out of the war were unjust. Though Ford held no formal Confederate rank in his position as Superintendent, General Hebert not only addressed him as �Colonel,� but also saw that he was paid as a full colonel. 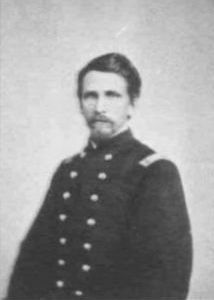 When General John Bankhead Magruder replaced General Hebert in 1863, he wrote Ford a confidential letter about again taking command of the fight along the Rio Grande. 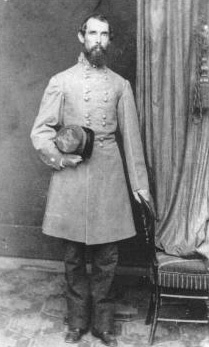 As part of the offer, Magruder attempted to secure Ford a regular commission in the Confederate army, but for unknown reasons, the Confederacy refused his request. As a result, the man who was to become one of the most famous Texas soldiers in the Civil War was never carried on official Confederate military rolls, and Magruder was unable to formally divert men from state or Confederate forces to serve in Ford�s new command. Magruder did, however, conspire with Ford to provide the veteran Texas Ranger with several small state militia and paramilitary units that were serving on the southwestern frontier. These units would serve as the nucleus of Ford�s regiment. He drew the remainder of his men from draft-exempts�men too young or too old to be draft eligible. Since the new regiment did not have an official designation, Ford dubbed it the Cavalry of the West. His personal �uniform� consisted of a battered black cavalry fedora emblazoned with a CSA emblem. Calling himself Colonel, Ford made it stick with pure bravado and somehow managed to assemble a remarkable staff. A former Cotton Bureau man, Captain C. H. Merritt, served as the regiment�s quartermaster, and Captain W. G. M. Samuels rode down from north Texas to serve as the ordinance officer�if Ford ever managed to round up any artillery. Major Albert Walthersdorff, a huge German capable of lifting an errant recruit off his feet with one hand and shaking him, served as the regiment�s tactical officer, and Major Felix Blucher was the regiment�s Chief of Staff. In addition, Blucher was a highly skilled surveyor and geographer who knew the area south of the Nueces River like the back of his hand. Ford drove the regiment south without mercy, relentlessly pushing the new recruits to the limit of their endurance in the already sweltering heat of early spring. The winter of 1863-64 was a time of extended drought in south Texas. The brush country was burned dry and many of the streams and water holes had disappeared. Skeletons of cattle and other unfortunate animals littered the trail and only the skill of Major Blucher in locating what little grass and water remained kept the regiment moving south. 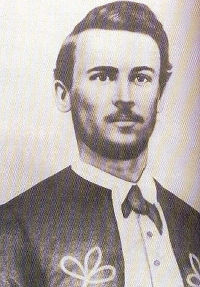 Within the week, the column was encamped at Banquette where Ford received word from Santos Benavides, who with the support of his own numerous clansmen, was fighting off the Yankees from behind cotton bales in the streets of Laredo. Putting out riders to secure his flanks, Ford pushed hard and relieved the besieged Benavides on 15 April. The Cavalry of the West could now muster nearly 1,800 men. The new Union commander at Brownsville, General J. F. Herron, could deploy well over 6,000, supported by twelve field pieces and sixteen heavy guns. However, with Mexico currently embroiled in political and military chaos, Rip Ford was far more concerned with events taking place south of the border than he was with anything that Herron might do. The conflict along the Rio Grande was much more than a war between the North and the South. There was also an ongoing civil war in Mexico between the liberal, federalist faction who were determined to separate church and state, and the conservative, centralist faction who struggled to maintain the status quo and thus their own power. In 1859, Benito Juarez temporarily led the liberals to power and the United States recognized him as the legitimate President of Mexico, but then in 1861 he made a serious mistake by suspending all payments to foreign creditors and confiscating the property of foreign nationals. This flawed policy eventually led Napoleon III of France to place Austrian Archduke Ferdinand Maximilian Joseph on the throne of Mexico. In the midst of this political and military labyrinth, Ford now launched the Cavalry of the West into the triangle that formed the southern delta of the Rio Grande. He planned to lead his force in a classic guerrilla campaign. 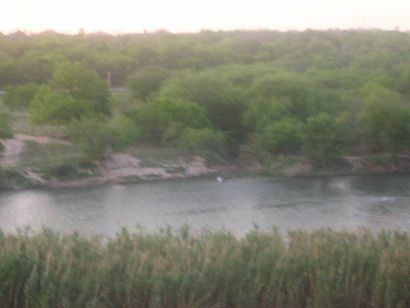 Drought had rendered the pasture along the Rio Grande scarce, and with hundreds of horsemen. Ford was rarely able to assemble his entire unit at any one place. This situation, combined with the fact that he had almost no regular source of supply, forced him to scatter his command over hundreds of miles and depend mainly on the Mexican side of the river to meet his military and forage needs. Gathering a force of nearly 400 men under his personal command, Ford began to roll up the Yankee garrisons one-by-one, as his Indian fighting captains darted in and out of the heavy chaparral along the river, cutting the Union line of supply and communications with a series of daring, well-executed ambushes. Ford�s cavalry had the advantage of mobility, while most of the Union army was bluecoat infantry, sweltering in the burning, almost tropical heat of the lower Rio Grande. During this time, The Cavalry of the West received practically no assistance from the Confederate government. The Confederacy certainly had adequate forces and supply available in south Texas, but Ford got nothing from the establishment except trouble. Orders were even issued taking some of his troops away. He certainly had General Magruder�s support, but try as he might, Magruder could not make his own brigadiers either like Ford or accept him. In fact, Generals Duff, Bee and Slaughter despised Rip Ford and his whole ragtag outfit. In spite of the drawbacks, Ford took the field again in June. Unfortunately, his old malaria returned and he was burning up with fever and reeling in the saddle. It took unrelenting willpower to go forward, but Rip Ford not only held on, he won the love and respect of every common soldier in his command. 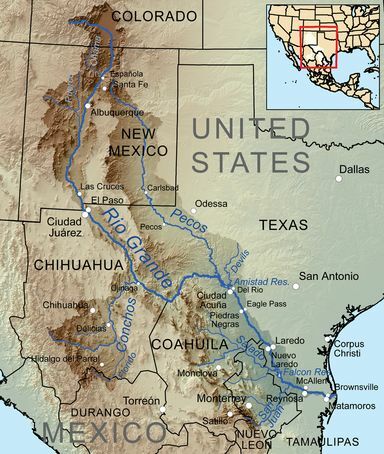 By 21 June, the Cavalry of the West was only thirty miles from Brownsville. Through supreme effort, they had driven the Federals back almost 200 miles. On 19 July, Ford, so ill that he could not mount without assistance, assembled his entire command of about 1500 men and advanced toward Brownsville. His ranks may well have been full of young teenagers and old men, but they were all of a leather-tough, frontier-raised generation, lean and muscled. Many of them were just as sick as Ford, but if Old Rip could manage to stay in his saddle, they sure as hell could, too. On 22 July, the Confederates tore into the Yankees at Ebonal with a shrieking rebel yell, driving the Union screening forces back into Brownsville, but Ford had once again outrun his supply line. The Mexicans refused to do business so close to the Federal guns, so Ford waited patiently, throwing out a cavalry screen until supplies could be purchased further upriver. He had no intention of charging directly into the Union trenches and the muzzles of the Yankee big guns. Ford once again ordered an advance on 25 July, this time with his dismounted Arizonians leading the way on foot. An impasse soon arose with little damage inflicted by either side, but Ford still refused to order a charge into the face of the deadly Union guns and the Federals refused to leave the protection of their trenches. With the Confederate success, civilians began to cross the river to bolster Fords forces�one old man was a veteran of San Jacinto. On 30 July, the Arizonians made a reconnaissance of the outskirts of Brownsville and found things strangely quiet. The cavalry quickly mounted and rode in, finding the town in possession of a group of armed Confederate civilians. The Federals had hastily departed, leaving only a trail of scattered equipment that led off from Fort Brown toward the coast. Ford immediately detached a small force to pursue and harass the retreating Yankees, and they managed to drive the Union rearguard in upon the main body before breaking off the brief skirmish. Reaching the Gulf, the Union troops splashed across Boca Chica to the safety of Brazos Island, a sandy strip some four miles long. Without fighting a major engagement and with few casualties, Rip Ford and his Cavalry of the West had driven a far superior Federal force out of the lower Rio Grande valley. Most of the Union troops were embarked on waiting ships, leaving only 1,000 soldiers under the command of Colonel H. M. Day to occupy Brazos Island. Ford managed to see the Stars and Bars hoisted over Brownsville before he collapsed in a dead feint, so ill that for the next several days he commanded the regiment from his sickbed. The first official communication Ford received from his district commander, General Thomas Drayton, arrived in the form of a complaint. The Confederate government had offered full pardons to deserters who fled to Mexico and allowed returning soldiers to join the regiment of their choice. Drayton was angry because so many of the returnees chose to join the Calvary of the West, a fact that hardly improved Ford�s relations with Drayton and the other Confederate brigadiers of the district. In November 1864, Brigadier James E. Slaughter established his Western Sub-District Headquarters in Brownsville. Ford remained in command of the Brownsville area, but the relationship between him and Slaughter was uneasy at best. During the next few months, the population of the lower Rio Grande valley exploded. Brownsville grew to 25,000, Matamoros to 40,000, and the makeshift town of Bagdad swelled to nearly 15,000. Cotton was flowing once again and times were flush, with common laborers earning as much as five to ten dollars a day in silver when workers in St Louis made no more than twenty cents an hour. In the midst of all this prosperity, the Calvary of the West rode picket duty with threadbare uniforms and underfed bellies. Ford and his men had gone unpaid since departing from San Antonio. 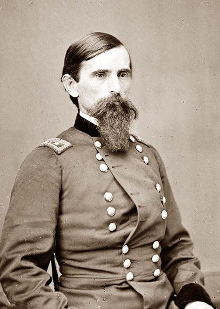 On 6 March, 1865, Union General Lew Wallace, who was later to author the classic Ben-Hur, arrived on the Rio Grande with a fantastic scheme, whereby the Confederate troops under Ford and Slaughter would surrender and be permitted to rejoin the Union. 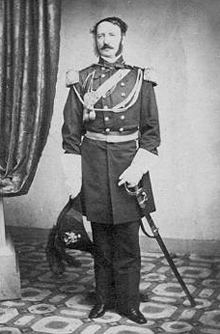 This force would then be joined with Mexican troops under President Juarez to drive the French out of Mexico. On 11 March, the parties met at Point Isabel under a flag of truce. Both Ford and Slaughter realized the Confederacy was tottering on the brink and they were at least willing to discuss terms, but everything collapsed when dispatches referencing the discussions fell into the hands of Confederate Major General J. G. Walker. Walker was an officer of the �last ditch school� who was determined to fight on to the bitter end. He severely reprimanded Slaughter and Ford for even considering such an offer, and the project came to an abrupt halt. Before noon the following day, Ford�s cavalrymen were assembled on the parade ground at Fort Brown, including the French artillery he had borrowed from the Foreign Legionnaires headquartered in Matamoros. Ford mounted and led the Cavalry of the West southeast toward the sound of the guns. Four hours of hard riding brought the column to Palmito Hill, now wreathed in a halo of powder smoke from the heavy fighting. Barrett had thrown the entire Union strength into the advance, but his Indiana and New York regiments were nearing exhaustion in the humid heat after a long nighttime forced march. Lieutenant Jones immediately unlimbered the Confederate guns on Palmito Hill and opened fire, blasting the Union advance with both solid shot and canister. Meanwhile, Ford sent some infantry to threaten the Union left and circled his cavalry to the right under the cover of some thick brush. Quickly putting his horsemen on line, Ford rode to the front on his anxious, prancing stallion and called out, �Men, we have whipped the enemy in all previous fights. We can do it again.� The cheering of the troops alerted the Yankees and they began to fire into the brush. Ford yelled, �Charge!� and led 300 screaming cavalrymen into the exposed Union flank. The shrill rebel yell could be heard above the roar of the guns as the Confederate horsemen shattered the Union skirmish line. Nothing was more terrifying for infantry than to be scattered to the winds and left to the mercy of a thundering cavalry charge, and the veteran Hoosiers and New Yorkers never had a chance. Colonel Barrett called for a retreat, but fear and the confusion of battle caused him to forget the Hoosiers on his extended picket line and the Rebels rode them down without mercy. During the long retreat to Brazos de Santiago, Barrett tried several times to halt his fleeing men and form them into defensive line, but convincing the men to make a stand once they were running was nearly impossible. The Yankees were stumbling from exhaustion when they finally reached the waters of the Boca Choa, firing wildly in all directions at the circling Confederate cavalrymen and frantically trying to splash their way across the narrow straight to safety. Suddenly, General Slaughter galloped up to Ford in the fading light of the day at the head of Carrington�s battalion and demanded that Ford launch an attack on Brazos Island. Ford refused to attack in the dark. The furious Slaughter then splashed his horse into the shallow water and emptied his revolver at the fleeing Yankees�now more than 300 yards away. The men of the Cavalry of the West looked on in amazement and disgust. That night, Ford withdrew his force to Palmito Hill. Casualty counts vary wildly, but one study found 4 Union dead, 12 wounded and 101 captured. None of Ford�s men had been killed although a number were wounded. Palmito Hill was the last pitched battle of the Civil War, having taken place over a month after Lee surrendered at Appomattox. Within a few days, General Kirby-Smith surrendered the Trans-Mississippi Department and Ford dismissed his men and took his family across the border. He returned in July when the Union offered paroles and declared a general amnesty, but there were a few diehards in the Cavalry of the West who refused to surrender on any terms. Instead they chose to encase the regiment�s colors, bury them in the sandy soil along the Rio Grande and ride south to join Maximilian�s army. Ultimately, many of these brave and stubborn men fought with distinction in the French Foreign Legion and left their bones scattered across fields of honor from Mexico to Europe. References for "The Cavalry of the West"
Buenger, Walter L., Secession and the Union in Texas, Austin: University of Texas Press (1984). Fehrenbach, T. R., Lone Star: A History of Texas and the Texans, Da Cappo Press (2000). Ford, John S., Memoirs (MS, John Salmon Ford Papers), Dolph Briscoe Center for American History, University of Texas at Austin. 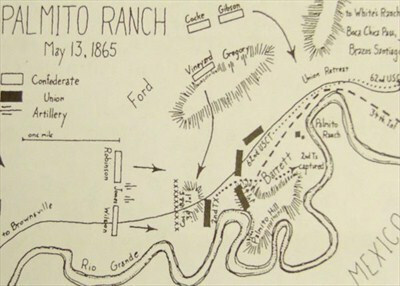 Hunt, Jeffery William, �Palmito Ranch, Battle of,� Handbook of Texas Online (http://www.tshaonline.org/handbook/online/article/qfp01, accessed 11 Mar 13. Kurtz, Henry L., �Last Battle of the War,� Civil War Times Illustrated, April 1962 (Vol. 1, No. 1). Marvel, William, �Last Hurrah at Palmetto Ranch,� Civil War Times, January 2006 (Vol. XLIV, No. 6). Trudeau, Noah Andre, Out of the Storm: The End of the Civil War, April-June 1865. Boston: Little, Brown & Company (1994).